Cofidis team riders Julien Simon and Christophe Laporte had cameras fixed to their bikes during the Critérium du Dauphiné team time trial stage on Tuesday, giving a rare glimpse into this unique cycling discipline. Rather than racing against the clock individually, all of the squad must work together seamlessly to put in a good time. Five riders must cross the line together, with the fifth rider producing the squad’s time for the stage. The stage commences with the riders leaving the start ramp, and quickly getting down into an aerodynamic position as they form a line. Riders take it in turns at the front, moving to the back when it is the next rider’s turn at the helm. The amount of time they spend at the front can be determined on how good that individual is feeling – and some riders may literally be hanging on in there among team-mates who are stronger against the clock. 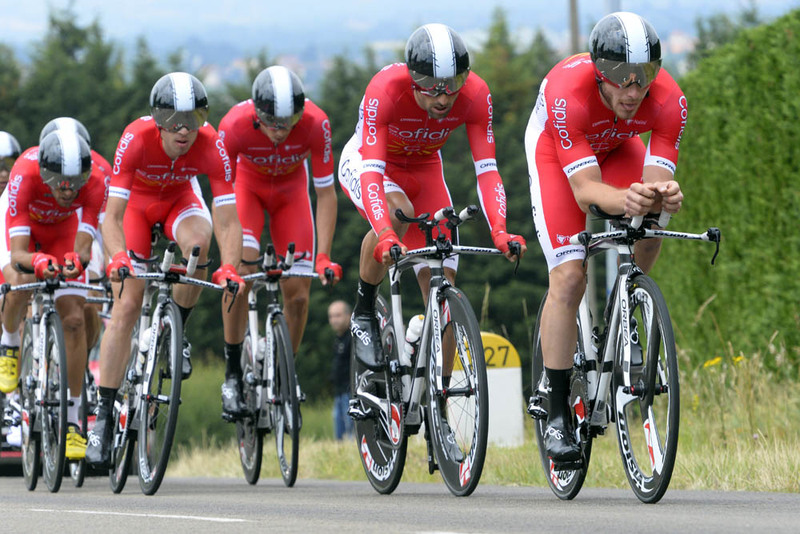 Although Cofidis’s performance looks slick from the video footage, the French team actually finished last on the stage out of the 21 squads present. The completed the 24.5-kilometre undulating route from Roanne to Montagny one minute and 49 seconds adrift of stage winners BMC Racing. The 2015 Critérium du Dauphiné concludes on Sunday, June 14, after several mountain stages that will decide the overall classification. Australian Rohan Dennis (BMC Racing) is the current overall race leader after his squad’s success in the TTT stage.